Advantages: Interesting and entertaining text; quality images; scale plans; excellent format. Many of us found our love for the Airship through Dr. Douglas Robinson’s landmark titles “The Zeppelin in Combat” and “Giants of the Sky”. These remain English language classics and have helped students of the subject all over the world. Ray Rimell has corresponded at length with that author and much knowledge has been passed on. It’s fitting then that the editor of Albatros Productions writes the first installment of this series. This book takes a different approach to most that has preceded it. Usually we are presented with a chronological history from the LZ1 onwards but not here. Volume 1 focuses on Germany’s WW1 “P” and “Q” class Zeppelins. The so called “R” class or “Super Zeppelins” will be covered in the second installment. There are 76 quality A4 pages between the soft card covers, as well as a set of excellent foldout plans. These latter items are sized to 1/350 and both classes of Zeppelin described in this publication are represented. Martin Digmayer does a first-rate job drawing these and the included BE2 really gives a sense of scale. The various gondolas are given special treatment in 1/96 scale as is the “spy in the sky” SPÄHKORB. Detail views of the upper forward gun platform also make an appearance to further the readers understanding of the layout. The photographs number at least 130 and these are reproduced to a very high standard. It’s a very diverse and revealing collection with informative captions to match. Many are printed to half page size and this allows the viewer to get full benefit from the image. 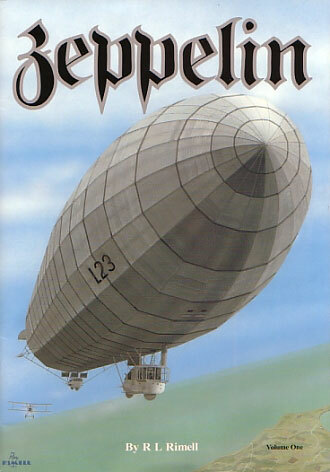 As well as covering the technical aspects of these airships, the author relates the more “human” side of Zeppelin life. There are many personal accounts presented, which include operational raids, the dramas of ground handling these monsters, surviving on the upper platforms, and even being refused rescue from the sea. Colours and markings are not forgotten with a varied selection of attractive artwork being presented. These cover three subjects as well as generic engine and control / engine gondolas. A “spotters guide” is also included which will help the reader identify uncaptioned subjects from other sources. The format chosen for this publication is refreshing. By splitting the Zeppelin types over two volumes, the author does not run the risk of trying to cram too much information into the limited amount of pages available. The text is interesting without being too technical and this easily keeps the readers interest. The good quality images add further worth to this publication and enthusiasts will enjoy its relaxed style.